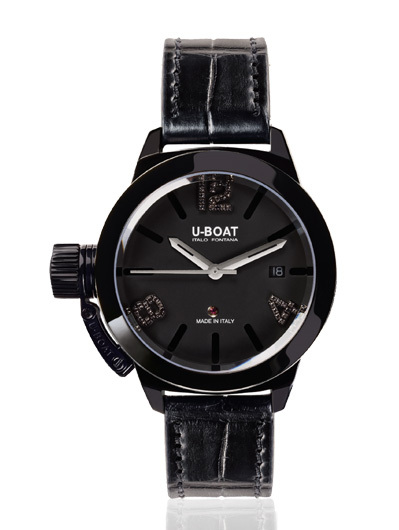 MOVEMENT: automatic mechanical, personalized to U-Boat specifications for stem to be positioned at 9 o’clock. Aiguillage adjusted: H4. Frequency: 28.800 vibrations per hour, 4 Hz. Power reserve: 40 hours. 25 jewels. Height: 4,60 mm. FUNCTIONS: hours, minutes, date at 3 o’clock. CASE: stainless steel 316L AISI, with subsequent IPB treatment, shiny finishing, distinguishing crown on left side, with a special protective device. Diameter: 40 mm. Thickness: 12,22 mm. Weight: 77 gr. BACK: see through, sealed with 7 external screws. 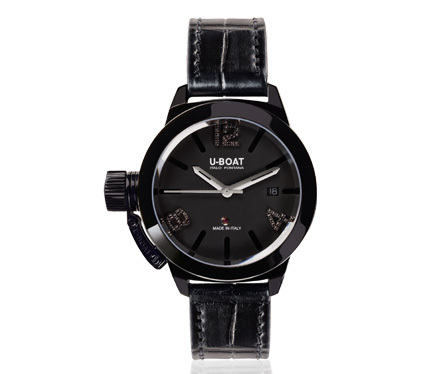 DIAL: there are two superimposed dials, black with 43 black diamonds set on indexes 12/4/8 (brilliant 8/8 cut, 0,9 mm diameter). Visible ruby. Bâton indexes. Perforated spheres, shiny finishing. CRYSTAL: high quality sapphire, scratchproof. STRAP: hand made and hand finished alligator black leather, lining in red Alcantara. Tongue buckle. Width: 18/18 mm.